The third reason why there won't be a repeat of the so-called political tsunami that denied the Barisan Nasional its traditional two-thirds majority is what a journalist calls, "the end of Pakatan's innocence". Back in 2008, the pact that bound PKR, PAS and DAP together was new, even though the idea of a multi-party coalition itself wasn't. The BN coalition had been a success formula for decades, bringing together various parties under the leadership of Umno, and there were no intellectual copyrights involved so all Anwar Ibrahim had to do was took an old concept and gave it a new packaging. It worked - well, almost! Pakatan won 5 states and broke the BN's two-thirds stronghold on Parliament. 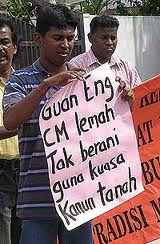 After five years, however, the freshness that was Pakatan has turned quite stale indeed, at least too some quarters. Promises were not fulfilled (perhaps that was what drove Khalid Ibrahim to say recently that Pakatan's manifesto was not a promise!?) and each component of the pact started to show signs of stress. Those who used to support the pact have abandoned it. The latest was Hindraf, the Hindu body that threw its support solidly behind Anwar Ibrahim against Abdullah Badawi because of the promises made to it. Today, in fact earlier this afternoon, Hindraf has openly called on Hindus and Indians to give the BN back its two-thirds majority in Parliament. The formerly exiled Hindraf leader P.Waythamoorthy said Hindraf had "begged" Pakatan Rakyat to endorse its blueprint even after five years of non-delivery towards Indians in Pakatan-administered states. "Even after they failed to deliver in five states, I told them we can do it right this time, in this election. Until few days ago, I was still begging them. They said there will be a meeting, but none of the leaders showed up," Wathamoorthy said h e r e, adding that Pakatan had "insulted" Hindraf. Hindraf isn't the only one disillusioned with Pakatan Rakyat. UMNO pulak sibuk attack rocket !! Helen Ang siang malam tibai christian !! after reading the news today I believe there will be another round of Tsunami. The indian will punish the PR for all the sins they commited in past 5 years on Indian. is it true hindraf wanted a cabinet post, Datuk? Think and act like one or just return to India..
Do you remember the texts below? Who is now the turncoat? For you, some cash, same like the tiny bones licked up by this so called Hindraf rep, will do to make you bark the way the corrupt regime dictates. "I really don't know why the Malaysian government is still putting up with these people who claimed that the "Umno-controlled Malaysian government" was sponsoring "genocide" against the Indians in this country with the use of "Islamic-backed militants". I thought this organisation had been banished but obviously I was wrong. They are still around championing their racist agenda. While they beg the Tuans from the government of the Queen of England to rescue them, some of them are making hay in Malaysia's sunshine. A couple of them, in fact, tried to use this "cause" as a passport to become British citizens! Typical umNO logic... There can hardly be any development in opposition controlled states as it does not get Federal support. Everyone knows that except the umNO species. Nobody believes writings like these anymore. Open your eyes and tell me if umNO can ever win seats in urban areas? Exactly how many seats does umNO have in cities and major town's (please exclude Putrajaya)? "after reading the news"... You concluded. Aha which paper? But can anyone remember any contribution he made of significance? Would you hire him to look after your father’s clothing department? You know what to do in the coming election? Just reject him!